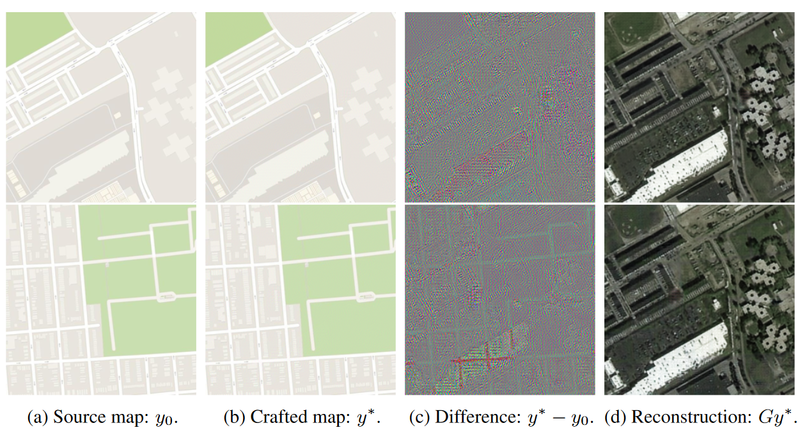 The intention of the researchers was, as you might guess, to accelerate and improve the process of turning satellite imagery into Google’s famously accurate maps. To that end the team was working with what’s called a CycleGAN — a neural network that learns to transform images of type X and Y into one another, as efficiently yet accurately as possible, though a great deal of experimentation. This was the year Amazon went all-in on the Alexa. September saw the announcement of a new Echo Dot, Show and Plus, a subwoofer, an audio input device, an auto dongle and an amplifier. That would have been plenty, but the company also started dipping its toes into the other side of things. 2018 also found Amazon experimenting in the connected device category — namely a microwave and wall clock (oh, and a singing fish, too). It’s a strange move on the face of it. After all, there are countless companies currently vying for a small slice of that mindshare. But Amazon’s got a few key things going for it. For one, the company stands to gain from building products that exist solely to complement its Echo devices. For another, it’s able to sell products at — or close to — cost. The Echo Wall Clock benefits quite a bit for both of these factors. It’s $30 device that’s essentially useless without an Alexa device. In fact, Alexa is required to set the time. That’s a downside in the off-chance you happen along one of these products without an Echo nearby. But it’s handy when it comes to set up. Find a spot within 30 feet of a compatible device (Echo, Dot, Show, Plus, E Spot or Input.). Open the back. Pop in four AA batteries (included). Tell Alexa, “Set up my Echo Wall Clock.” Hold the little blue button on the back until the front light turns a kind of pulsating orange. Alexa will go to work, and when everything’s good to go, that light will turn blue. I initially attempted to set up the device on my office Wi-Fi. Never a great idea with these sort of connected products. Large enterprise networks are a crapshoot, and the two devices were off again, on again. Assuming you’ve got a similar set-up, you’re going to want to keep the Wall Clock (and, for that matter, most Alexa devices) at home. Once I switched to a personal network (via a MiFi), things went much more smoothly. Alexa will set the clock to your time zone. Bonus: It will automatically fall back and spring ahead when there’s a time change — certainly a leg up on most wall clocks. There are a couple of things worth noting here, before we go any deeper. 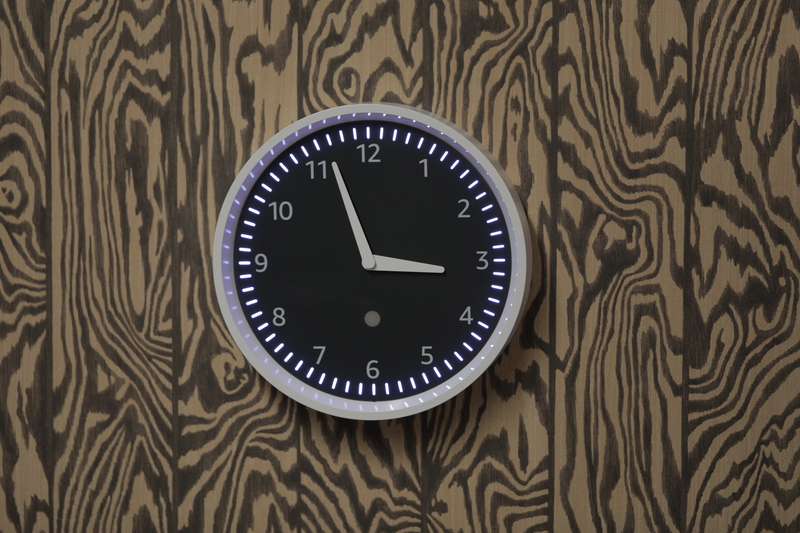 First: the Wall Clock is, for lack of a better term, cheap looking. It’s big and it’s plasticky. There’s no front glass. It is, honestly, the sort of design you’d expect from a wall clock made by Amazon. There’s no razzle dazzle here. 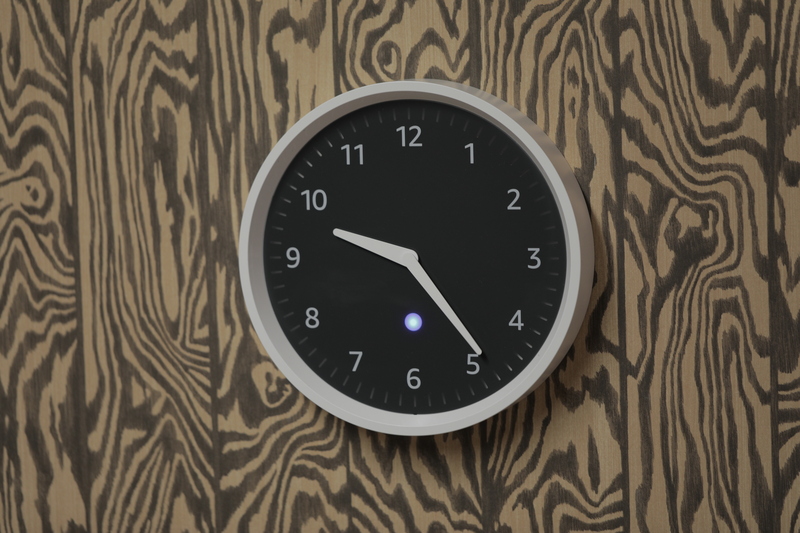 It’s a simple-looking clock with a simple design. The upshot is it’s minimalist enough to fit in with most living rooms and kitchens. That simplicity also extends to its feature set, which is currently mostly limited to timers. The 60 minute markers that line the edge are actually all individual LEDs. Tell Alexa to, say, “set a 10-minute timer” and 10 minute hands will light up and then individually go dark to count down the time. Once the countdown is over, the full diameter will flash slowly until you tell Alexa to stop. And that’s it, really. Timers and alarms. The Wall Clock is one of the first passive Alexa devices from Amazon. Your Echo is really doing all of the heavy lifting, including listening and talking. You can’t, say, ask the clock for the time or the weather, which is why you need an Echo close by. It also doesn’t emit a sound when the alarm goes off. Of course, that means a cheaper price — and much longer battery life. The Echo Wall Clock isn’t a necessary device, but it could prove a handy one. If you cook a lot, for instance, it’s nice having a large visual reference in addition to the Echo’s built-in timers. Beyond that, however, I’m struggling to come up with too many scenarios in which it feels indispensable. And honestly, I’m not holding my breath in expectation that Amazon will be bringing more to the table here. 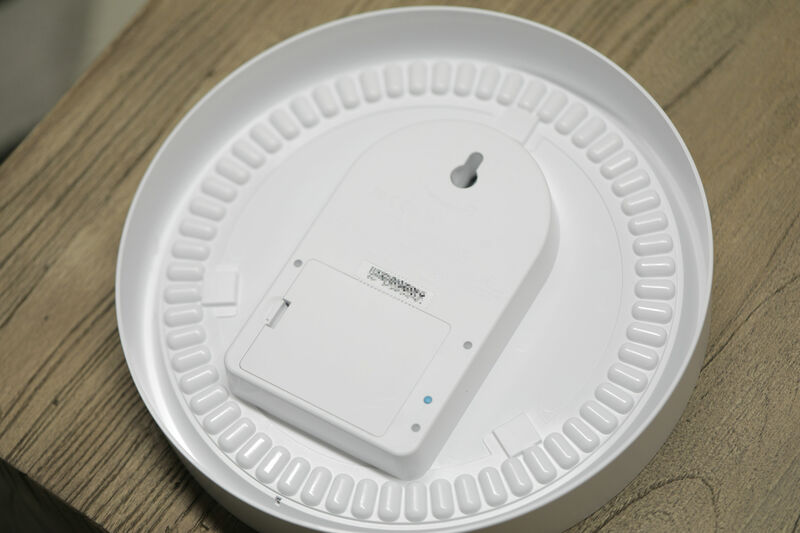 The device succeeds more as a proof of concept for the ways Alexa and compatible devices can push the boundaries of the smart home. There’s nothing particularly compelling here for most consumers — but at $30, perhaps it doesn’t have to be. Some Tesla employees will ring in the New Year on a sales floor this year as the automaker tries to liquidate its inventory of Model 3 sedans — and even its more expensive Model S and Model X vehicles — before the federal tax credit for EVs is cut in half. In a list of updated hours, 44 of the stores, including locations in California, Minnesota, Nevada, New York and Ohio, are open until midnight Monday. Tesla has more than 100 stores and galleries in the United States. Calls made to several of these stores indicate these locations have a mix of Model 3 sedans available for pickup today. Sales associates didn’t provide specific numbers. After midnight Monday, the $7,500 federal electric vehicle tax credit will drop to $3,750 for anyone buying a Tesla vehicle. Tesla CEO Elon Musk has been using Twitter to warn of the expiring tax credit for months now. Recently, the pace of promotion has escalated as Tesla’s inventory of Model 3 vehicles in the U.S. has persisted. The company reportedly had more than 3,300 Model 3 vehicles in inventory in the U.S. as of Sunday, according a blog post by Electrek. Now with just hours left before the federal tax credit drops, Tesla and Musk are making a special effort to reduce the Model 3 inventory in a final sales push. Earlier this year, Tesla hit a milestone when it delivered its 200,000th electric vehicle. The achievement was a noteworthy occasion for an automaker that didn’t exist 15 years ago. However, it also activated a countdown for the $7,500 federal tax credit offered to consumers who buy new electric vehicles. The tax credit begins to phase out once a manufacturer has sold 200,000 qualifying vehicles in the U.S. Under these rules, Tesla customers have to take delivery of their new Model S, Model X or Model 3 by December 31. After December 31, the federal tax credit is cut in half to $3,750 for new Tesla customers. The tax credit is reduced again after June 30 to $1,875 before disappearing altogether at the end of next year. News junkies who want something more in-depth than Alexa’s Flash Briefing now have a new option for listening to the day’s news – as well as features and other reporting – right from their smart speaker. A company called Noa has just launched an Alexa skill that uses human narrators to read you the news from top publishers like The New York Times, Financial Times, The Economist, and others. With the skill, you can catch up on the stories you missed while you’re doing other things – like cooking, cleaning, commuting or exercising, for example. Noa, meanwhile, employs a team of half a dozen narrators based across the U.S., U.K., and Ireland who read the stories published by the company’s current partners. These include: The New York Times, Financial Times, Business Insider, The Economist, The Independent, Bloomberg, The Irish Times, and the Evening Standard. That list will grow in 2019 to include more news organizations and magazine partners, the company says. You can then ask Noa to read the news by published, journalist or category. Not all articles from the publisher partners will be available, explains Noa CEO Gareth Hickey. “Only a limited subset of articles lend themselves well to audio – namely, the opinion and feature style stories. Essentially longer-form journalism,” he says. The skill also employs a metered-access paywall that allows listeners to stream up to ten articles per week for free. To listen to more, you have to subscribe at $7.99 per month (or €/£7.99 per month, depending on location) for unlimited access. The company doesn’t currently support Amazon Pay, so you’ll have to sign up at Noa’s website or through its mobile apps, if you want to upgrade. The Alexa skill is the latest from the Dublin-based startup Noa, founded in 2015 by Hickey and Shane Ennis, with the goal of providing access to audio journalism. “While audio-journalism is a core part of our offering, personalised discovery and quality curation are equally as important,” Hickey says. “The goal isn’t to inundate users with audio articles, but instead to help them learn and understand the news,” he adds. Given Noa’s focus on audio, smart speakers make sense as the next big platform to address – especially now that they’ve reached critical mass. The startup raised $600,000 last year, Hickey notes. It’s not the only company working to provide human narration of the news for the booming smart speaker market. SpokenLayer, for instance, currently powers “Spoken Edition” podcasts for many news publishers, including TechCrunch. And Amazon’s Audible Channels launched with spoken-word recordings from publishers like the The Wall Street Journal, The New York Times, Harvard Business Review, Foreign Affairs, Charlie Rose, McSweeney’s, The Onion and other periodicals. Noa’s Alexa skill is called “Noa – Journalism, narrated,” and is free to install and use for up to 10 articles per week. Noa also has a limited presence on Google Home, allowing listeners to hear four Editors’ Picks each day. But its next version will allow for journalist, publisher and category navigation – the same as on Alexa. Noa will soon launch on Android Auto and CarPlay, as well. The use case here is also similar to that of “read it later” apps like Pocket or Instapaper, both of which have added an audio playback option for listening to your saved articles. However, those apps currently rely on text-to-speech functionality, not on human narration. Noa, meanwhile, employs a team of half a dozen narrators based across the U.S., U.K., and Ireland who read the stories published by the company’s current partners. These include The New York Times, Financial Times, Business Insider, The Economist, The Independent, Bloomberg, The Irish Times, and the Evening Standard. The Alexa skill itself is called “Noa – Journalism, narrated,” and is free to install and use for up to 10 articles per week. Earlier this year, Netflix was seen testing a bypass of iTunes billing across dozens of markets worldwide. As 2018 draws to a close, Netflix – the App Store’s top grossing app – has ditched the ability for new users to sign up and subscribe to the streaming service within its iOS app across all global markets. The change means Apple will miss out on hundreds of millions in App Store revenue per year – money it would have otherwise received by way of its standard cut of in-app transactions. To date, the Netflix iOS app has generated over $1.5 billion through its in-app subscriptions, with Apple’s cut coming in around $450 million-plus, Sensor Tower estimated. Before the change, Netflix on iOS was grossing an average of $2.4 million per day in 2018 – meaning Apple was making around $700,000 by doing nothing other than allowing Netflix to offer subscriptions in its app. In 2017 its gross subscriber revenue was $510 million – up from $215 million users spent in the app in 2016 – which earned it the No. 1 spot on the Top Grossing Chart for non-game apps. It snagged that position again this year, trailed by Tinder and Tencent Video. In fact, Netflix has earned the bragging rights for being the top grossing iOS App of all time, App Annie reported this summer. The streaming service’s decision to bypass the App Store isn’t a first. Many companies today direct their users to the web or other platforms, in order to avoid marketplace fees. And Epic Games this year bypassed Google’s Play Store altogether – as well as its 30 percent cut – when it launched Fortnite for Android as a sideloaded app. That decision resulted in Google’s loss of $50 million+ in marketplaces fees. However, Netflix still earns money on Google Play through existing subscribers. That totalled around $105 million in 2018, with Google earning close to $32 million of that. But the number has been declining consistently, Sensor Tower said. Apple could soon be in the same boat.